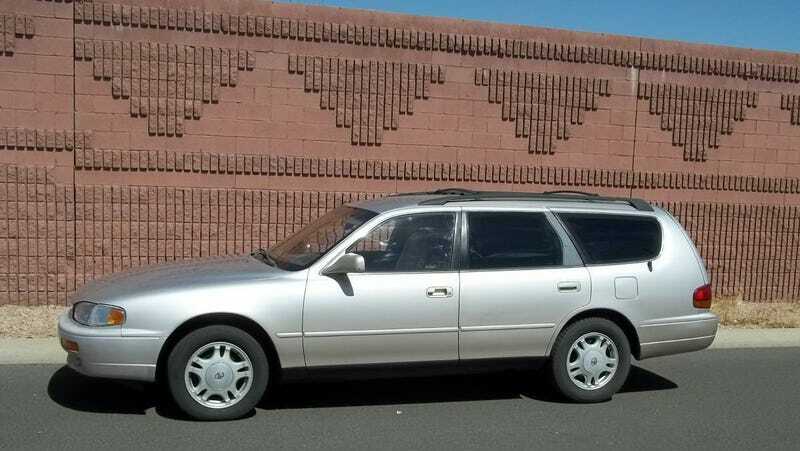 At $5,625, Is This 1995 Toyota Camry Wagon a 7-Seat Superstar? The seller of today’s Nice Price or Crack Pipe Camry says he’s priced it at the very top of NADA Book value. Let’s see if the car lives up to the hype, or if you’d rather turn the page. When you were little, did you even step into your dad’s shoes, or slip on your mom’s bra and whisper to yourself “someday…”? If you ever did either of those things then you can probably feel the lament expressed by yesterday’s 2007 Porsche Cayman. That car carried the front clip of its older and bolder sibling, the 911 GT3. Talk about aspirational. Unfortunately, the rest of the car didn’t seem to live up to the expectations set by that nose. In the end, its somewhat high mileage and $17,999 price doomed it to a 68 percent Crack Pipe loss. I’m going to go out on a limb here and say that there is no way that today’s car could ever not meet expectations. That’s because it’s a 1995 Toyota Camry and this generation of that mid-size family car has a reputation for being one of the sturdiest soldiers on the planet. Offered up in Phoenix so you know that it also won’t come riddled with rust, this V6 powered longroof looks to still be playing the long game. And, while you might be dismissive of any from of Camry ownership the wagon edition has two fun features that elevate the car from mundane to marvelous—a third row seat and two wipers on the tailgate to entertain those who sit back there. This particular Camry comes in Champagne over beige mouse fur, which, admittedly, is about as dull a Dora a color combo as you could ever want to date. That’s okay though. That lets you slip under the radar. The 3-litre V6 pumps out a respectable 188 horsepower and 203 lb-ft of torque and isn’t bemoaned on online forums. Taking orders from that here is Toyota’s Sinatra-smooth four-speed automatic. The ad notes that everything works as it should, and adds that the car has passed emissions testing. No CELs or other warnings are present to harsh your vibe. The ad says this of the car’s prospective next owner: “when u buy this car, u will NOT have to fix anything, immaculate condition.” That comment makes me think that the seller is channelling Prince. Like that deceased rock impresario’s guitar work, it also may be a little over the top. I say that because one thing I can see right away on the car is what looks to be a broken driver’s side door handle. That probably makes egress something of a hassle and hence will to need to be, well... fixed. Hopefully that will be the extent of the repairs needed to keep this Camry on the road. The seller says that the car comes with copious maintenance records but doesn’t say when was the last time the timing belt was done. With 195,000 miles on the clock it should be on its second one at least. Better if it’s already rocking its third. A clear title and just two owners round out the car’s resume. The interior looks to be in decent shape with just a loose panel handle in back of which to complain. The car seats seven in a pinch, literally, but should do four in comfort along with a weekend’s worth of bags. Back in the early ‘90s when Ford was developing the third generation Taurus this was the car they benchmarked. The problem for Ford was that this generation of Camry was at the time one of the most over-engineered and least cost-efficient of Camry models. Ford went with similar complexity in the Taurus while Toyota replaced this Camry with the XV20 model that was vastly simplified in its construction. Cue sad trombone for Ford. We never got a wagon version of that successor model in the U.S. making this edition the last Camry longroof sold here to date. Appreciably, because of that, and the over-building, it’s also the best. The best can cost extra, and in the case of this Camry, the seller has delved into the NADA Price guide to set his asking. He says “low book is 3050, (average. book is 4375), high book is 5625,” and hence has set his price at that high-end. Thanks NADA. You know need to decide if that’s actually a deal for this tidy wagon—and keep in mind that it will be delivered with a full tank of gas! What do you think, is $5,625 a fair asking for this Camry as it’s presented? Or, does that price make you want to throw the book at it. 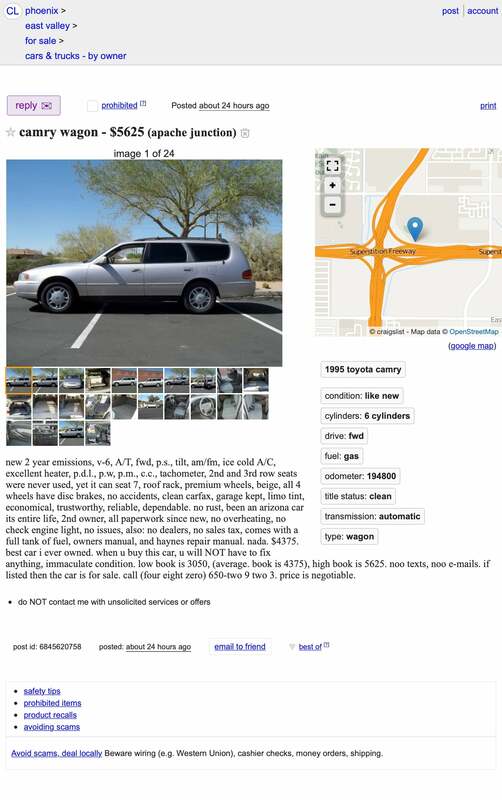 Phoenix, AZ Craigslist, or go here if the ad disappears. At $17,999, Will This 2007 Porsche Cayman Win it by a Nose?